I have never considered having a dining experience with another local from my own home town – Singapore. Afterall, it does not make complete sense for me to dine with a local when I am already one myself. But dining with Rani and her family was such a joy, that it completely proved me wrong! ‘Hello! Come on in!’ were the first words of my hosts for the night and I had to double check the unit number to make sure I was indeed in a strangers’ house. I felt so at home with the warm friendly welcome by Rani and her husband. Besides the cordial company that embraced our arrival, the interior of the house could be easily summed up in 3 words: modern, spacious, and homely. We had a nice chat while sipping the Mango Smoothie that our local host, Rani has prepared for us as a welcome drink. We later learned that Rani was from South India, and had been living in Singapore for a good 12 years with her Singaporean husband! Rani and her husband were a perfect team in the kitchen! They worked like a pair of cutlery; it was a wonderful sight to see! As cheesy as it might sound, to me, Rani and her family feel like long-lost relatives. A gathering like this felt like a mini strangers’ reunion- unfamiliar yet heartwarming. While preparing for Kerala curry dish, Rani would share with us the different spices that she used to enhance the flavors of the chicken. These authentic spices were hand-carried by Rani from India. Not only do they work great to elevate the taste of the dish, but spices such as turmeric powder also have a medicinal effect that could cure cancer and boost the immune system. It would be safe to say that Rani’s cuisine really does the job of nourishing the body while satisfying my Umami cravings. A dining experience like this provides a sneak peek into the work behind the local food that I have always taken for granted. Despite being able to easily spot a Papadum, lightly roasted crisps in the public canteen, the process of frying one was an entirely foreign experience for me. Nothing comes more fascinating than seeing a flat dough crumbling into golden crisps upon meeting the hot oil. Perhaps this almost-magical experience was how the name of Rani’s kitchen magic came about? I’ve got to say the spices and their fragrances does a great job in whetting my appetite because my stomach was grumbling by the time Rani and her family formed a human chain in setting up the tables in serving me and Fai, my friend who accompanied me for this experience. No authentic Indian cuisine experience would be complete without eating your meal with your bare hands! Rani and her husband tutored us on the art of eating with your hands, before long, Fai and I were able to eat Indian cuisine the authentic way. Scooping rice into our right hands, and moving our thumbs skillfully to push food into mouth. I guess we must have looked pretty amateurish because Rani snapped some shots of me and Fai out of great fascination. I really love how there were multiple conversations happening concurrently during the meal times, it was as if they are all fighting for air time. 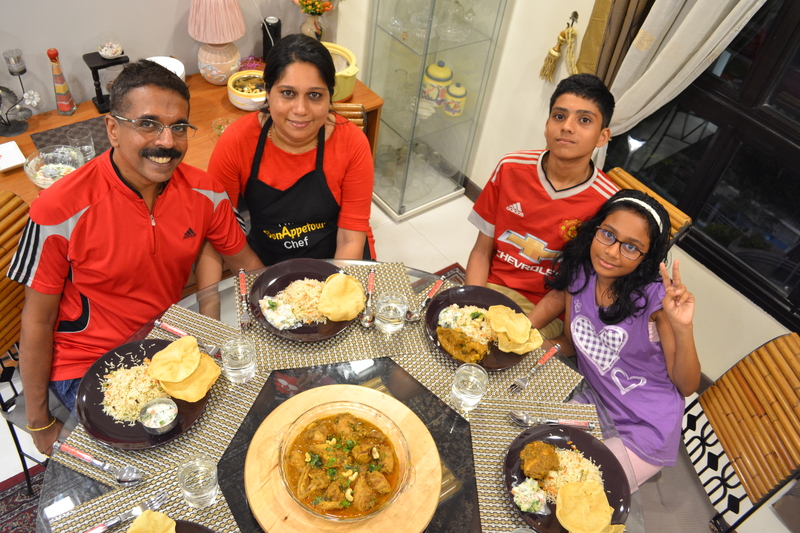 This dining experience is a really precious one to me because it is not an everyday affair for me that the whole family get to spend some common time collectively. Rani and her family definitely did a fabulous job in granting me the opportunity to indulge in an authentic and genuine company of true blue Singaporeans. Book your Rani’s homely dining experience here!